During the 1940s entertainment included synchronized swimming shows called water follies. These were often accompanied by music and were performed live as well as being portrayed on film. You might be more familiar with some of the grand effects on film that starred Esther Williams as part of the Ziegfeld Follies. After a little more research I've come to find out that fabulous dress designer Irene Lentz, who was know as 'Irene' was uncredited for some of the costume work in this movie. This movie has an outstanding cast, see credits below. You can order it on VHS tape here for pennies, or DVD here. I'm headed to the library today to see if they have it, or maybe the local video store that is closing. Have you seen this one? Ziegfeld Follies; directed by Vincente Minnelli; music and lyrics by Harry Warren and Arthur Freed, George and Ira Gershwin, Ralph Blane and Hugh Martin, Kay Thompson and Roger Edens; produced by Arthur Freed for Metro-Goldwyn-Mayer. 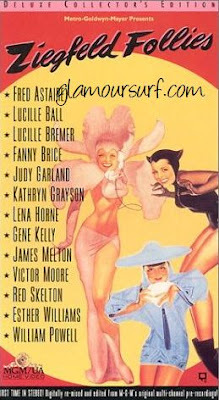 Fred Astaire, Judy Garland, Fanny Brice, Red Skelton, Lucille Bremer, Lucille Ball, Kathryn Grayson, Lena Horne, Gene Kelly, Esther Williams, James Melton, Victor Moore, William Powell, Edward Arnold, Hume Cronyn, Marion Bell, William Frawley, Cyd Charisse, Keenan Wynn, Virginia O'Brien, Robert Lewis and Bunin's Puppets. This is a glorious and glamorous film indeed! William Powell reprises his role as Florenz Ziegfeld-He played him once before in The Great Ziegfeld.